Digital editing gives editors far greater freedom than ever before to move scenes of information around and place them anywhere in a film's sequence. Apple's Final Cut Pro is the most widely used Mac-based digital editor, and is especially popular with independent filmmakers and graphic artists. 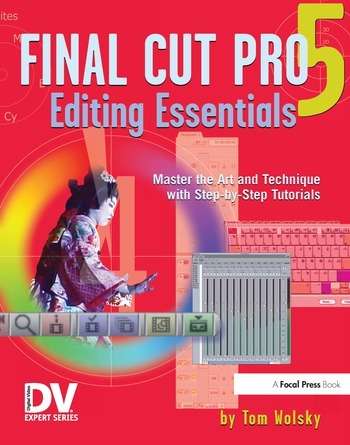 Final Cut Pro 5 Editing Essentials enables readers to master the craft of digital editing on Apple's Final Cut Pro. This full-color editing workshop features eight tutorials that provide firsthand experience with the art and technique of editing. Covering the essentials - capturing material, organizing it, editing, adding transitions, basic titling and sound techniques, and outputting from the application - the tutorials are explained in jargon-free language by a seasoned teacher and digital editor. This book includes a companion DVD filled with graphic files for the tutorial projects to help users hone their editing craft. The DVD files are also available at http://www.taylorandfrancis.com/cw/wolsky-9781578202867/.